If there was one key factor that they could implement that would help propel them to millionaire status, what would it be? I mean, can anyone go from nothing to a millionaire? Can this be taught to the average person and have them generate results virtually overnight? In fact, if you talk to a few of my students you will find that within 4 to 6 weeks of implementing the strategies I teach, their lives begin to totally transform in all areas. Health and fitness, spiritual and emotional, family and relationships, career and travel, financial goals and material things, contribution, giving back and making a difference. Can a 3D vision board open up a gateway to help you tap into your preferred state of being so that all of your dreams, goals and desires begin to manifest at lightning speed? YES it can! How do you make it happen so easily and effortlessly virtually overnight? Can YOU do it too and have success? Read this blog post to discover the secret. What you will find interesting is that when people hear the steps, each step seems so simple. And this is very true. The steps themselves are VERY simple. Getting a person to TAKE ACTION and implement them? Now THIS is where the real challenge lies. This is the VOID ZONE. What if I told you that your ego will resist going through this process? Especially when it begins to conflict with your core beliefs about making money. Things like “you have to work hard for your money”. Because of this, most people won’t take any action at all. It’s completely normal, and part of the human condition (suffering syndrome), so don’t beat yourself up over it. 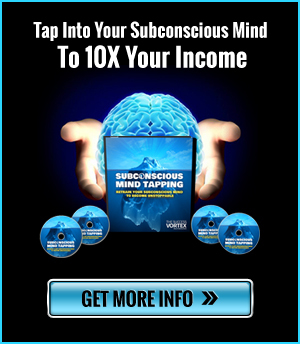 But if you are one of the few that do….this blog post will put you well on your way to a MILLIONAIRE LIFESTYLE in record time. VISION: “The Art of Seeing What Others Cannot Yet See”. This has always been a topic that has intrigued me and one that I have explored extensively. In my early twenties, I studied with Tony Robbins and eventually opened up for the Firewalk in Vancouver. For 2 1/2 years, I worked with Dr. Lee Pulos at Life Long Communications as VP of Marketing studying The Power of The Subconscious Mind. For 2 years I worked with Dr. Dov Baron as VP of Marketing studying Quantum Physics and creating our own reality. The one consistent factor in all these years of studying was ACTIVATING YOUR VISION. Why Is a 3D VISION BOARD So Important? In order to get somewhere, you need a destination. Imagine wanting to go on vacation and calling a travel agent and saying “Give me two tickets”. Where would they send you? Who knows! That is why your destination is so important. It is all connected to your preferred state of being. And the 3D VISION BOARD makes that destination ultra clear. When it comes to manifesting it into your reality, it needs to be so crystal clear that you can FEEL IT, TOUCH IT and EVEN TASTE IT. This is why achieving the depth of 3 dimensions is so critically important. Here is the chain reaction that needs to take place for you to be able to manifest your dreams. Thought Directed Emotion That Generates Feeling. This is called The Equation For Manifestation and it is a formula that I learned while working with Dr. Dov Baron. I highly recommend his home study program if you want to fast track your way to the top. It is highly effective and a formula that I use everyday. Go here to get it. There are a few things you need to create a 3D Vision Board. There Are 3 Steps to Creating Your 3D Vision Board. Flip through the pages of the magazines quickly and rip out anything that makes you feel good or changes your state. This could be a word, a sentence or a picture. Look specifically for nature pictures in the ripping stage with horizon lines. This will create the foundation of the background of the vision board. The horizon lines will create the illusion of depth and 3 dimensions and will help to create the visual perception of an opening into your new reality. Close crop around the words and sentences and some of the objects like people, cars, planes, boats, watches etc. This will help to create more of the 3-dimensional look. Start off by gluing down the nature pictures. The background should come together like pieces of a puzzle and blend into one another VS. being a rectangle shape next to another rectangle next to a rectangle. Cover up the joining areas with close-cropped images and words to create an overall blending effect. 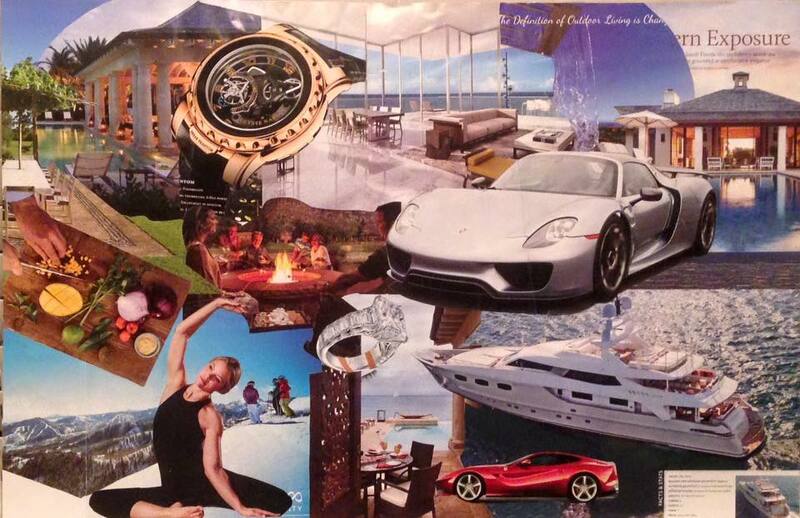 The 3D vision board should look like you can walk right through it into that new reality. It should pull you into it all the way to the horizon lines. The distance between the front objects to the horizon lines should look like it could be as far as 100 miles away. One of my own 3D Vision Boards before adding any words to it. Once the vision board is complete you need to write out the following BY HAND in a journal. I know I will be successful when…. As well as ten “I AM” Proclamations. Each morning and evening for 5 minutes you need to read something positive that will increase your resonance or vibration, I recommend The Secrets of the Millionaire Mind by T. Harv Eker and Ask and It Is Given by Esther and Jerry Hicks. Once you complete 5 minutes of reading, stand in front of your Vision Board and stare at it until it no longer looks flat. Read ALL of the words and sentences on the board OUT LOUD. Then read the proclamations with EMOTION and CONVICTION. Then be the like Rocky on top of the mountain and say the words YES! YES! YES! You should begin to get goose bumps and you should feel a state change. Finish off with this statement – Soon my dreams will be part of my past. Once you FEEL the shift in your physiology, that is your body communicating with the Quantum Field and broadcasting that resonance so that your dreams, goals and desires start to want you just as much as you want them. Make a commitment to doing this for at least 90 days in a row and watch the miracles begin. LOOKING TO ACHIEVE ULTIMATE SUCCESS? Ultimately, success with your MLM business requires a working knowledge of both lead generation and personal branding. Learn to build your down line by becoming an Alpha Networker both offline and online. 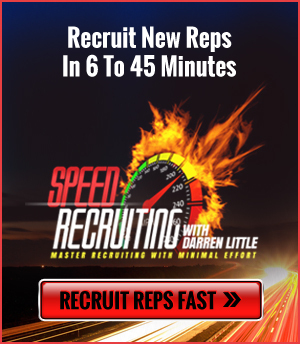 Additional online training to help you Sponsor More MLM Reps is available with Darren Little.